A collection dedicated to the Rostock: The Ultimate Rostock Printer Thing Collection! Thanks for this and all your great posts! Looking forward to get some feedback if it helps. I was going to so that same thing (at some point) because it seemed like the ultimate test of the level bed. Nice! Thanks, I added it and that is very cool! I'll be printing this as soon as I get a new glass build plate. So, it looks like one should set layer thickness to .30mm in their slicer? mhackney wrote: Thanks, I added it and that is very cool! I'll be printing this as soon as I get a new glass build plate. Haven't tried what happens with 0.2mm but yes...I think 0.3 mm leaves a little bit of head room for uneven beds. I just measured my bed again and figured out, that it is slightly bent upwards to the Z columnd because I ahevn't got paper clips there... need to correct that. Thanks. Do you have a glass or borosilicate surface? mhackney wrote: Thanks. Do you have a glass or borosilicate surface? I've got a borosilicate plate. As described, I've got 5 paperclips along the edges, all between two of the screws holding the bed to the printer. Except at the top side, where the leads are soldered to the board. If I measure close to all three columns, as well as their "negatives" (e.g. X -112.6/-65 and -112.6/65), I see that the glass plate is bent from center to the Z column. Or, as I leveled Z at the three columns, the X and Y negatives are far below zero. I probably need to attach more clips on one or both sides of the soldering pads. @Highcooley - I have tried printing your calibration thing and some weird stuff is happening! After it prints the large circle first (2 wide) it then prints these odd dashes where the smaller circle is, then prints some other areas and comes back and fills in those dashes. The dashes are causing all sorts of headaches. I suspect this may be a slicing issue. What app and what parameters did you use to slice yours? Do you have a smaller nozzle perchance? Mine is .5mm. Odder yet - that feature does not appear in your STL file! Your file clearly has 2 rings - a larger one and one about 1/2 to the center. My sliced version is printing 3 rings. The larger one you see here and another about 1cm inside that. Then the smaller ring. That smaller ring may also have another inset ring but I have stopped the print before it gets that far. Vary odd slicing issue. The radial line you see coming from X should go all the way to the outermost ring but it stops at the phantom inner ring! Ok, I figured part of this out! The outermost circle is a perimeter not the part! If I don't explicitly set extrusion widths (to .55mm) and let slic3r calculate them (.70mm) then the circles are generated as a continuous bead and not broken up into the "dashes". I think I can print it now. mhackney wrote: Ok, I figured part of this out! The outermost circle is a perimeter not the part! If I don't explicitly set extrusion widths (to .55mm) and let slic3r calculate them (.70mm) then the circles are generated as a continuous bead and not broken up into the "dashes". I think I can print it now. Sorry for my late reply. I was off during weekend. I sliced with slic3r, having set the nozzle to 0.5mm. I would have to check, if I set 0.55mm as the extrusion width. Anyway, I didn't have these dashes. But something other was a bit strange. Instead of printing continuous outlines one after the other, the perimeters where split up to different sections and the letters where printed separately. Although I checked the design twice, that the different parts should be merged into one single part, this somehow doesn't seem to be the case. Maybe netfabb would help. But I haven't tried it yet. There are three different versions of the extensions. A single extension (you'll need to print two), a pair of extensions, or a set of small spacers to use instead of the big extensions. Great, thanks! I've added it to the collection. Mhackney, thanks for adding it to the collection. Here's a pic of the kit installed. Cool. I am going to print it tonight to use with my new Add-A-Struder that is due to arrive tomorrow! FYI - RichRap (the one an only) uploaded some Rostock things today that I added to the collection - a JHead adapter and an extruder. That was quick! Thanks, added to the collection. I'll print one of these too, I don't like that flat melamine spindle. It works great too! I love the little clip that holds it in place. I have the full extension set printing now. My add a struder kit is due to arrive today and I received my Rainbot filament today. I now know what this extension is all about, those are WIDE spools! 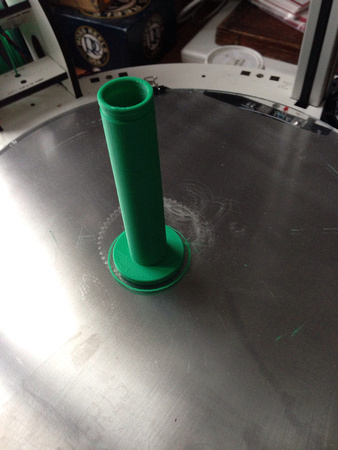 @AV8r RC - I really love the way the filament spools roll smoothly off this Spool Rod! Nice upgrade. I used to have to baby-sit the filament spool to make sure it didn't get stuck, no longer with this. I am printing the extended set in black ABS to compliment my white Add-A-Struder kit! Yeah those spools are pretty wide. I'm glad it's working good for you. I'm working on a fan duct right now. The one Highcooley posted will not work with the new nozzle.